Oval pull backplate with Traditional styling, offered in satin nickel finish. The backplate is used to cover existing holes to mount a new pull. High quality Aluminum die cast base material. The Liberty 3 inch Satin Nickel and Black Ceramic Insert Spoon Foot Pull reflects casual living at its best. It features a 3 inch center-to-center, rear-mount design for easy installation. The metal base material is built for endurance and is covered in a satin nickel finish. 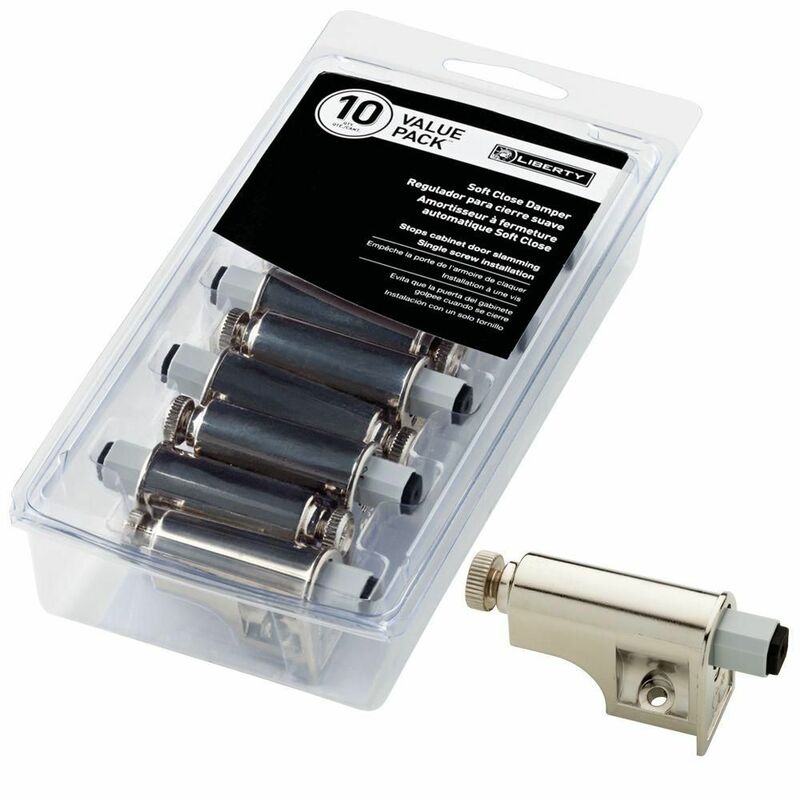 Cabinet Door Soft Close Damper 10 pc Stop the slam with this soft close adapter that quietly and smoothly closes cabinet doors. It can be adjusted by the turn of a screw to the desired closing speed and is the perfect retrofit solution. This damper is easy to mount in the upper corner of your cabinet. Cabinet Door Soft Close Damper 10 pc is rated 4.1 out of 5 by 144. Rated 3 out of 5 by Pianomn255 from It was easy to swap out the old ones. Unfortunately not all of them have the same tension. They s... It was easy to swap out the old ones. Unfortunately not all of them have the same tension. They should strive for better consistency. Rated 4 out of 5 by Mamabear from The damper worked great for most of the doors. Some doors seemed not heavy enough or the hinges w... The damper worked great for most of the doors. Some doors seemed not heavy enough or the hinges were mounted wrong. I will be ordering more. Rated 1 out of 5 by DepotJoe from Great idea -- poor product execution. Quality is definitely... Great idea -- poor product execution. Quality is definitely lacking. Despite appearance of chrome finish, construction is lightweight plastic. Adjustment screws on 2 out of 10 in shipment did not work. When installing, screw MUST be at 65 degree angle per instructions, very unforgiving. Any deviation and damper will not seat flush with cabinet frame. Unable to create similar damping speed on cabinet doors of different sizes, even with adjustment screws. Damping effect highly dependent on size and weight of cabinet door. Smaller doors close very slowly. As a repetitive impact product, durability is questionable because of low quality construction. This product has potential to be very popular if it were manufactured to higher standards. Rated 5 out of 5 by Robert from Worked as advertised no more slams!!!... Worked as advertised no more slams!!! Will these work with Drawers? Has anyone ever used these on drawers? In the description they mention drawer and I would like to use it on my kitchen drawers. Is one enough per drawer or is 2 required?